2015 has been a fantastic year for us. We wanted to thank everyone who has supported us in our first year and helped us curate and maintain a really in depth and detailed map of everything vegan in the city. We have made so many friends and learnt so much this year and are so looking forward to the launch of the new app in 2016. After today we will be signing off from our Vegan Norway work for little while and taking a little christmas break to spend some quality time with our family and friends. This christmas the Vegan Norway team will be together in Bergen and we have invited our friends from one of favourite UK vegan restaurants; V Revolution to visit us. We have decided that this year we will actually spoil ourselves with not one but TWO christmas dinners so we can do our own vegan versions of both traditional norwegian and tradition english festive fodder. As you all probably know, the traditional norwegian christmas dinner usually consists of lots and lots of meat, with a side order of meat and maybe some more meat? This seems to be what people get excited about over here. However many norwegian vegan food bloggers are helping vegans find cruelty free alternatives. Over in the UK, the turkey sits as the prime focus at christmas dinner, and is usually accompanied by potatoes cooked in goose fat and sausages wrapped in bacon. 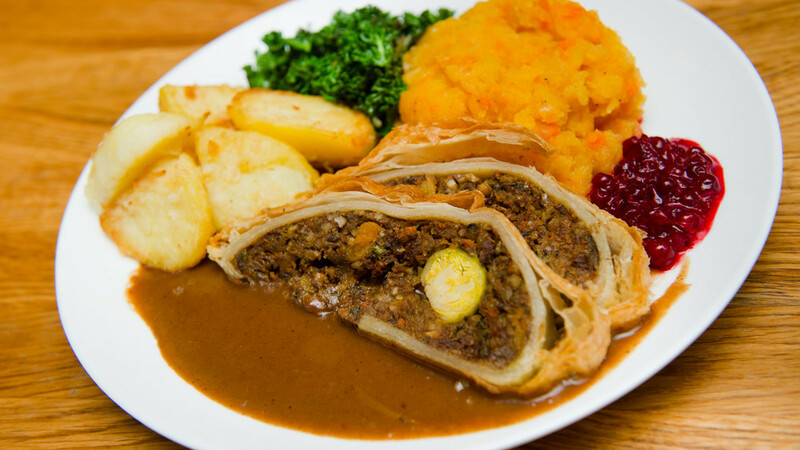 We think that christmas is a time for compassion and caring for ourselves and our loved ones and whilst many of these traditional meaty dishes hold strong emotional connections and memories to many, we are hoping that many meat lovers will think about how much tradition is really worth and consider a meat free or meat reduced christmas dinner instead. There are so many great seitan recipes out there but our seitan is unique to us and has been perfected over time. This year I modified an old family recipe for stuffing by adding facon and using soaked chia seeds to replace the egg. Nøttesteik - a recipe we bastardised from Veganmannen, Vegetarbloggen and Green Bonanza. There are so many fantastic recipes floating around for Nøttesteik, so this year we combined elements of three of the best ones into out own ultimate nøttesteik. We suggest that you do the same! This is a wonderful cruelty free remake of a classic norwegian christmas food. We made a big batch of Facon this year and used it as part of our seitan stuffing, it also will accompany the vegisterkake beautifully. We love fancy sides, and we bought lots of different coloured striped carrots so we can make this one. Bulk up your traditional Brussels sprouts with some cauliflower – the spice and roasting brings out their natural sweetness. A twist on classic Vietnamese summer rolls. No norvegan christmas dinner would be complete without some tasty Surkål. Potatoes are the cornerstone of any traditional festive meal, but what is the best way to enjoy them? We usually roast our potatoes but this year we are trying this recipe from Jane because we absolutely love cinnamon. Alongside these sides we will also be making the beetroot salad from the new Funky Fresh Food's cookbook. This book is a vegans dream and there is a whole section devoted to christmas food in there! Here at Vegan Norway HQ we are massive granola fans but we had never made our own before. This recipe from Green Bonanza was really easy to follow and super simple to make, we plan to eat it on christmas morning! We love this rich gravy from Jamie Oliver's excellent vegan team. The best gravy is made properly from real stock. This spice mix is very handy to have a round for spicing up christmas veggies and sides. It's so aromatic and really suits the sweeter root vegetables that we tend to enjoy around christmas like parsnips and carrots. Mix the rice milk and the Soya Dream together in a jug. Put the cornflour and the demerara sugar in a saucepan and add just enough of the milk/cream mixture to blend to a smooth paste. Add the rest of the milk/cream mixture in small quantities, ensuring that each addition is fully blended before adding more. Do not rush this stage or you will end up with lumps. Switch to a balloon whisk and cook the sauce over a low heat, whisking gently but constantly. Continue until the sauce comes to the boil and thickens. Add the rum/brandy, stir in and heat through. If you want the sauce to be alcoholic do not allow to boil after adding the rum/brandy. If you want to remove most of the alcohol but retain the flavour, allow to simmer for a few minutes, stirring constantly as it will stick and burn very easily. A good slosh of rum/brandy. This is a great vegan (and gluten free) alternative to traditional norwegain riskrem. We just switched the honey for agave syrup. A traditional British Christmas pudding is a strange thing. Lots of fruit and nuts and alcohol crammed into a cake that is boiled for 5 hours days before christmas and served steaming hot and on fire. For years I wondered how I would recreate this without suet (the animal fat binder that is usually used) and now I'm so happy that The Vegan Society has shown us how! The last course of our huge dinner will be cheese, wine and crackers and we decided that this cheese log recipe was special enough for us. Egg Nog is more of an american christmas thing. But as american style coffee shops seem to have taken over our cities, things like egg nog lattes and pumpkin spiced things are not so unusual to us anymore. I used to thing Egg Nog sounded horrible but this eggless nut based version sounds pretty tasty to me. When stocking up on booze for christmas it is useful to use the Barnivore app and website to check which beers, wines and spirits are cruelty free. Norsk Vegansamfunn also have an excellent guide to vegan friendly wines which comes particulary in handy when you are trying to find a vegan friendly red wine (there is not many). This christmas we have stocked up on Faustino red wine and Meinklang white wine. We also treated ourselves to some nice norwegian beer from Kinn Bryggeri. This will be our last post of 2015. Thanks for a wonderful year, and for doing your bit to spread veganism. We hope that you will all be doing your bit over christmas to suggest to your friends that they try going vegan as their new years resolution? Read more about Veganuary and the 31 days challenge and get involved over social media. Here's to a compassionate 2016, we wish you all the best.